Pawel Miroslaw Wojciechowski was born in 2002 in Olsztyn and began studying music at the age of seven. In 2015 he entered the Zenon Brzewski Special Secondary Music School in Warsaw where he is still studying with professor Joanna Lawrynowicz-Just. Pawel is a laureate of many national and international piano competitions. Among them are: the Fryderyk Chopin International Competition in Jelenia Gora (2nd place and three special prizes, 2014), the Warsaw Piano Competition (prize for greatest personality, 2014), International Moszkowski Competition (2 place, 2017), International Leopold Godowski Competition (2 place,Warsaw, 2017), International Competition “Peace and Music” (1 place and special prize, Pietrozawodsk, Russia 2016), prestige Poland Music Competition Artistic Education Center under 19 years (2 place,as youngest participant, 2017), Fryderyk Chopin Competition for Young in Konin (1 place, 2017), the International Competition of Young Pianist dedicated to the Work of ‘Fryderyk Chopin’ in Narva (1st prize, EMCY prize and the best performer of J. S. Bach’s work 2018). 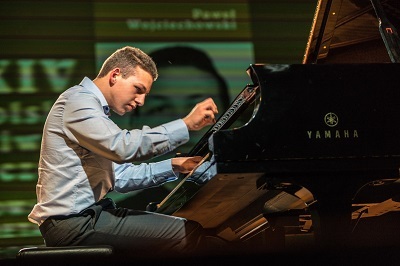 Paweł Wojciechowski has performed at Warsaw Philharmonic Hall, among other venues, with the Lower Silesian Philharmonic Orchestra, the Symphony Orchestra of the Holy Cross Philharmonic and Olsztyn Philharmonic Orchestra. In 2015, on the professor’s Vladimir Slobodyan special invitation , he performed in Kaliningrad with the Kaliningrad Philharmonic Orchestra. He has performed on the Fryderyk Chopin Birthday Concert series. He is a two – time recipient of the Minister of Culture and National Heritage and scholarship programme “Young Poland”. He is under the care of the Polish Children’s Fund. If you are interested in working with Pawel, please get in touch with the EMCY Office. F. Chopin – Polonaise in b flat minor op.posth.